Tracey Hecht is a writer and entrepreneur who has written, directed and produced for film. Her first middle-grade series, The Nocturnals was launched in 2016 with The Mysterious Abductions and The Ominous Eye. The American Bookselling Association chose The Mysterious Abductions as a Kids' Indie Next List pick. Her third book, The Fallen Star was released in May 2017. The fourth book, The Hidden Kingdom was released in February 2018. In partnership with the New York Public Library, Tracey created a Read Aloud Writing Program in 10 schools around New York City. During the year, she continued to conduct this program in over 35 schools, libraries and bookstores across the country. In June 2017, she launched a partnership with The Ryan Seacrest Foundation with The Nocturnals program at the broadcast media centers within pediatric hospitals. The first hospital was the Children's National Medical Center in Washington DC. In September, events took place in Nashville, TN and Charlotte, NC. When Tracey isn't writing, she can be found hiking, reading or spending time with her family. Tracey currently splits her time between New York City and Oquossoc, Maine with her husband and four children. Connect with the author at her website, Facebook, Instagram, and Twitter. 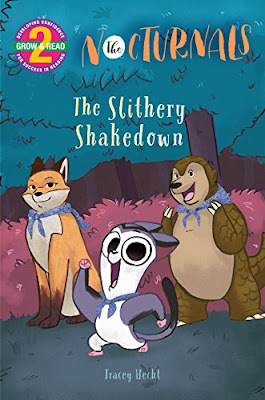 Enter to win a paper over board print copy of The Slithery Shakedown by Tracey Hecht and Josie Yee courtesy of Fabled Films Press (giveaway open to US residents only, sorry). Please use the Rafflecopter form below to enter. This giveaway ends at 11:59 PM ET on 04/10/2018 and the winner will be announced after 10:00 AM ET on 04/11/2018. All non-US entries will be disqualified. Void where prohibited.